Just released in time for Christmas: The Doll Violinist! Five days before Christmas, Emma is captivated by a doll in a shop window. Each day, she sneaks out of the orphanage to check if it’s been sold, but the shop owner, Madame Dubois, sends her away. Will the magic of Christmas bring Emma, Madame Dubois, and the doll violinist together? ABC’s Children’s Picture Book Finalist! Honorable Mention Award in the 75th Annual Writers Digest Writing Competition! Purchase from Guardian Angel Publishing or Amazon. Interview with Liesel Soley, author of Can You Be an Artist? My first writing was when I was in Paris on a Fulbright Grant. I was struggling with the violin and life, and one day when it was very difficult to approach the violin, I just started to write some poetry with no expectations or standards to meet. This took place over a period of about two weeks. It was a kind of a relief and my morale went way up. The poems remained in my violin case for 44 years! I couldn’t quite throw them away. Then several years ago my family requested I send them personal things I had created which resulted in putting together CDs of some of my solo violin and piano trio performances, a book of my paintings, and Yes! – those poems mentioned above along with some very short stories I wrote up about playing violin in the streets which I had been telling for years! Yes, even though I am a Juilliard graduate, I have hit the streets and had some interesting and fun experiences in the streets of New York, London, and Paris! Some of my friends look aghast at some of the things I do. I just laugh! So, this brings me to the children’s book I just completed. During the summer some of my students disappear, going to camps and on vacation, so it was either do something creative or sit around and mope because of a lack of work. “Can YOU Be an Artist?” came into being! Also – Dare To Follow Your Dreams! Dare To Be Yourself! Dare to Be Free!! I would lie awake at night mocking up the next illustration – hardly slept for 2 months. I was excited and determined to finish within two months before the school season started. The work was intense. I mocked up the illustrations easily but when it came to the execution of the drawings in terms of enough color it drove me nuts. I would create the drawing rather quickly then invariably at a certain point I would have exactly what I wanted but not enough color and I would stop and move on to the next illustration! I did not have the certainty and courage to do full color right off! I was afraid I would mess up on those tiny little lines or dots or whatever, like with expressions on faces, and that I would have to do the whole picture over again! O Man, I ended up going over these illustrations three times – the entire picture 3 times – each time adding another layer of color, each time in more agony than the previous time! It was awful! I was an idiot! I had used a POD place for the book of my paintings and although I was very happy with the results it was a lot of keeping at it to get exactly what I wanted. For my book with the poems and short stories about playing in the streets I used Apple. It was nice – but expensive. I wanted a publisher that had a team of experts, someone with whom I could communicate easily and someone who would get the job done quickly. Sheryn Hara with Book publishers Network had been recommended by an author/illustrator acquaintance as being very good for first time authors with plenty of experience and expertise and she really cared for her authors. She sent me samples of children’s books which I really liked. She was exactly what I wanted. She was hooked up with a fine printer so my book was completed! Things moved along very well. Sometimes there would be suggestions but my needs and wants as an artist were totally respected. It was suggested I use some kind of border around the pictures and a number were shown to me but I really did not want that and that was totally accepted. I groaned when Sheryn Hara said the cover of the book which I had done needed to be jazzed up. I told her I did not want anyone else doing any of the art work. She immediately said none of the art work would be disturbed – just the background would be made more alive. I was sent a number of possibilities and love the one I chose. I find it very aesthetic and am glad my publisher pushed me in that respect. At this time in my life I am primarily teaching violin, viola and chamber music, but my involvement in my other arts has increased considerably! I teach privately at my home 7 days a week and 3 afternoons in an after school program at Shorecrest . There are music teachers meetings to attend, and recitals and competitions to arrange. Add to that violin presentations and now book signings and work on PR. I also have arranged to have some of my young students perform at book stores and libraries where I have book signings. Things are busy! The short answer to your question is – I am very focused on what I am doing at any given moment, and I work hard 7 days a week. I thrive on lots of fast action! Sure – find something you have really wanted to do and START! Be true to yourself, maintain your integrity and do not let others throw you. Go at your own pace, keep it light and have FUN! If it is not always fun -well, so what! Yes, I would love to hear from you – to know if my book has inspired you or your children or your grandchildren. Also, I would be delighted to have you visit my web site and be in communication with me. 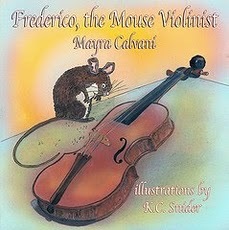 Frederico, the Mouse Violinist is an absolutely wonderful children’s picture book. Through a delightful story, the author teaches about the world’s most famous violin maker, Antonio Stradivari, along with various parts of the violin. But, what has a mouse to do with Stradivari and violins? Well, Calvani cleverly weaved a story that has Frederico living in the home where Stradivari creates his masterpieces. Loving the violin, the mouse wished he could play. At night while the master slept, Frederico would play among the violins and move the bow across the strings, making sweet sounds. Hearing the music and seeing Frederico’s appreciation for the violin, Stradivari created a special tiny violin for the mouse. Adding dimension to the story are full page illustrations that are vibrant and fanciful, making Frederico, the Mouse Violinist an engaging, kids-will-love-it picture book. The book also provides information on Stradivari; a glossary for words related to the violin, such as bridge, peg, and scroll; and two activity pages. It is an enjoyable and fun tool that parents and teachers can use to introduce the violin to young children. I happen to love the sound of the violin, cello, and other stringed instruments. My appreciation for music came from my musical family, as well as school music education programs. In 7th and 8th grades my school offered violin instruction which I happily accepted. Aside from the above mentioned benefits, you never know what will spark a child’s appreciation and love for music, it could be hearing a song, seeing musicians play, or learning about various instruments and their creation. –Karen Cioffi is an author, ghostwriter, and freelance writer. For writing and marketing information visit KarenCioffi.com, and sign up for her free newsletter: A Writer’s World. You’ll get 2 free e-books on writing and marketing in the process, and two more free e-books just for stopping by. Mayra Calvani combines the curiosity and playfulness of Frederico the mouse with the history and genius of Antonio Stradivari, the famous violin maker, to tell a delightful story of kindness and friendship. Children will learn music vocabulary and the parts of the violin as they follow Frederico’s nightly escapades. Curious Frederico peeked into the f-hole and looked inside the violin. “This is the secret, magical place where sound comes out!” he squeaked. The realistic, yet whimsical, illustrations by K. C. Snider add to the fun. The surprise ending of “Frederico the Mouse Violinist” will fill your heart with “warm fuzzies.” It may just inspire you to follow your dreams. As a retired teacher, I would recommend this book as a fantastic way to introduce stringed instruments into the classroom. A biography of Stradivari and his accomplishments are included in the back of the book. The activity pages will reinforce the new vocabulary introduced in the book as well. Do you have a budding violinist on your hands? Then he or she will definitely enjoy Frederico, the Mouse Violinist by Mayra Calvani. Frederico is a little mouse with a big name. He lives in the workshop of a famous violin maker named Antonio Stradivari. During the day, the mouse watches Stradivari make his celebrated violins, but at night, Frederico explores the workshop and its wonders. But it’s the violins that capture Frederico’s attention the most. Frederico longs to play, but since he’s so little and the violin and bow are so big, playing seems an impossible task. However, the determined mouse practices night after night and when he captures the attention of the famous violin maker, the mouse violinist has a mouse-sized present in store for him! 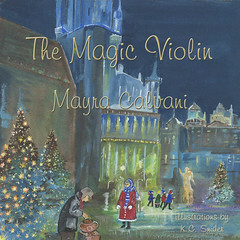 This is an endearing tale that will introduce young readers to the classic string instrument. Not only is the tale inspirational, but it’s educational as well, introducing young virtuosos to the parts of a violin and the famous luthier, Antonio Stradivari. As Frederico learns that if you tighten a peg on a violin, the pitch will be higher and if you loosen it, the pitch will be lower, so will your own virtuoso. And just as Frederico learns that with a little passion and practice, he can play, Frederico will inspire anyone to strum their own tune to this delightful story. What an unexpected source of delight this picture book is. This sweet story is about a young mouse who lives in the workshop of the most famous violin maker of all. With tender wording and sensitive illustrations, we see how the master violin maker makes yet someone else’s life change as a result of his musical genius and creativity. This is storytelling at its best. Every violin student and every violin teacher will treasure this book for its precious story about Frederico, the mouse, as he follows his dreams. Yet behind the tender story is an excellent explanation of the parts of a violin as well as a peek into the life of violin virtuoso Stradivari. The fantastic illustrations add a sense of wonder and delight to the telling, bringing the story to life. I highly recommend this book for every child whether a violin student or not. Their heartstrings will be tugged and they will yearn to hold a violin in their hands and play it themselves. This is also a great classroom book for teachers to read to students during those young formative years when they are choosing whether or not to play an instrument. Truly a new classic in picture books! Purchase from Guardian Angel Publishing. Shattered is the compelling story of a violin prodigy teenaged girl who runs away from home after her father shatters her beloved violin in front of her eyes. Thus, the word ‘shatter’ has a dual meaning in the novel. As Cassie learns to survive in the streets, she gradually learns the reason her father, a former violinist, behaved so explosively. While away, she meets a series of interesting—and sometimes dangerous—characters that indirectly help her grow and become a more mature and understanding human being. Cassie also searches for her elusive grandfather in an effort to learn more about her own father. 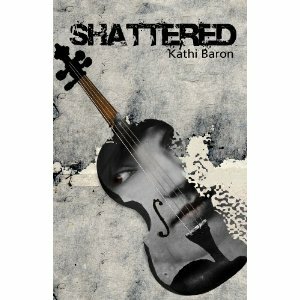 Human emotions are brought to vivid life in this first novel by talented new author Kathi Baron. Baron writes from the heart, with passion and sincerity. The prose flows beautifully and the story kept me engrossed all the way till the end. Cassie is a genuine protagonist most teenaged girls will identify with, especially young violinists. One aspect of this book that got my attention is that the descriptions of music and the violin sound very real even though the author isn’t a musician. This is a peeve of mine with violin novels: if the author isn’t familiar with the violin, the writing comes out as fake. But this didn’t happen with Shattered, so I have to congratulate the author on her research. Shattered is a coming-of-age story. It is also about the healing power of music and the complexity of family relationships. A must read for young violinists, especially girls! “This delightful story combines the magical element of an anthropomorphic mouse with a famous historic musical figure. Vocabulary words and interesting facts are woven into the story, making this an educational as well as entertaining read. Illustrator, K.C. Snider’s artwork hits all the high notes as well. Her depictions of the intrepid Frederico bring the story to life with vivid and colorful details. Additional information and activities—including a matching pictures game, glossary, and word search—encourage young readers to explore the book’s content in greater depth. The book is available in paperback, hardcover, and eBook versions. “Frederico is a mouse who watches the famous Stradivari make the finest violins in the world and longs to play one himself. Although a mouse is far too small to play a violin, Frederico keeps trying and one day…. well, I won’t give away the ending. “The illustrator, K.C. Snyder, combines cute mouse and realistic violin pictures to convey both the fictional story and factual information perfectly. “Frederico the Mouse Violinist by Mayra Calvani is a delightful story. I expected a fun read, but instead, found an enjoyable and educational story. Calvani hits that magical note where learning becomes exciting. The mouse is adorable as he discovers every part of the violin and when the famous Stradivari creates a gift just for our favorite furry friend, the reader feels the mouse’s joy. This is a book for the keeper shelf. Frederico the Mouse will become every young violinist’s favorite book and become the inspiration for others to play a violin of their own.” –J.R. Turner, award-winning author of the Extreme Hauntings series. “Frederico the Mouse Violinist, written by Mayra Calvani, is a sweet story about a small mouse who lives in the workshop of the famous violinist, Antonio Stradivari. 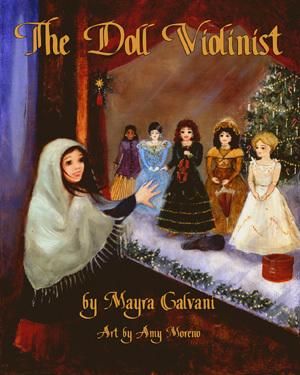 “Author Mayra Calvani has created a story sure to intrigue and educate children and their parents. Included in the text are the names of the parts of the violin in bold-face type. At the end of the story is a glossary of terms, and also some violin-related games for the young reader to play and solve. The hardcover is on sale for $15.95 (normal retail price $19.95). Also in paperback and ebook! Frederico the Mouse Violinist is out! I’d like to announce the release of my latest children’s picture book, Frederico the Mouse Violinist! Frederico the Mouse Violinist teaches the parts of the violin to beginners ages 3-8. The book is available in ebook, paperback and hardback formats from Guardian Angel Publishing. It should also be on Amazon, B&N and other online retail stores in about 1-2 weeks.